Kale is such a common green yet very underrated. These dark green leaves are one of the best greens to eat – high in fibre and a great source of vitamins. I bought a large bunch from the farmers market and to my surprise, the stems were bright yellow and a gorgeous deep pink! With so much kale, I decided make some into healthy (and very addicting) kale chips. I loosely followed Martha Stewart’s recipe – omitted the lemon and used garlic virgin olive oil instead of regular virgin olive oil. Pre-heat oven to 350 degrees, line your baking pan with wax paper or tin foil followed by thoroughly washing kale leaves. Lightly pat leaves to dry. Slice stems completely off and leave to the side (the stems will not “crisp” when making your chips) and slice leaves down the center, followed by small 1 to 2 inch pieces. Toss all sliced kale leaves in mixing bowl and add 1 tbsp of olive oil & a pinch of salt. 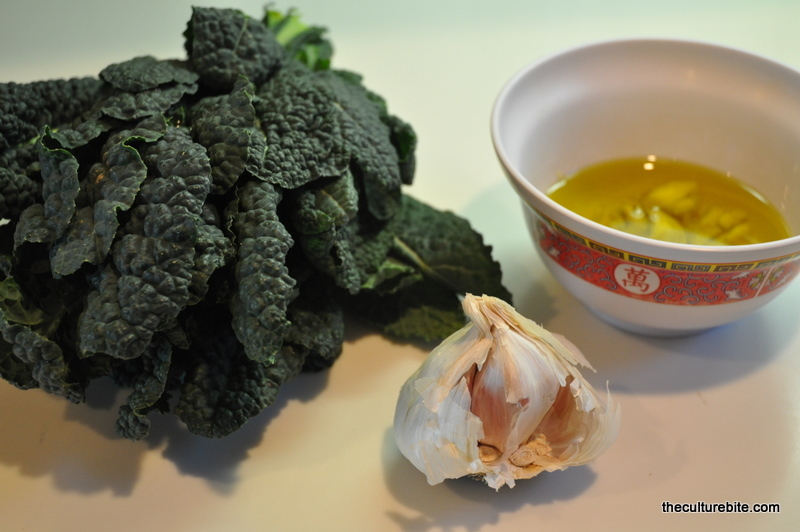 I used extra virgin garlic olive oil and sea salt (the garlic and kale leaves are a delicious combination). Once leaves are evenly coated, use tongs to place kale leaves on the baking pan and bake for 15 minutes. Check often and flip leaves over for even toasting. When finished “crisping” leave out to cool and sprinkle sea salt (to taste).